Porthminster Beach sits underneath the hillside in front of St Ives train station and is one of the first glimpses visitors get when arriving into the town. Quite simply, Porthminster Beach is stunning, often looking Mediterranean even in Winter. It is a large, sandy beach and is usually very sheltered, making it an ideal place for young children to play. It is one of the cleanest beaches in the South West and has been given the prestigious Blue Flag Award which guarantees the highest of standards. The beach is lifeguarded between May and September and a selection of water sports hire and lessons are available. 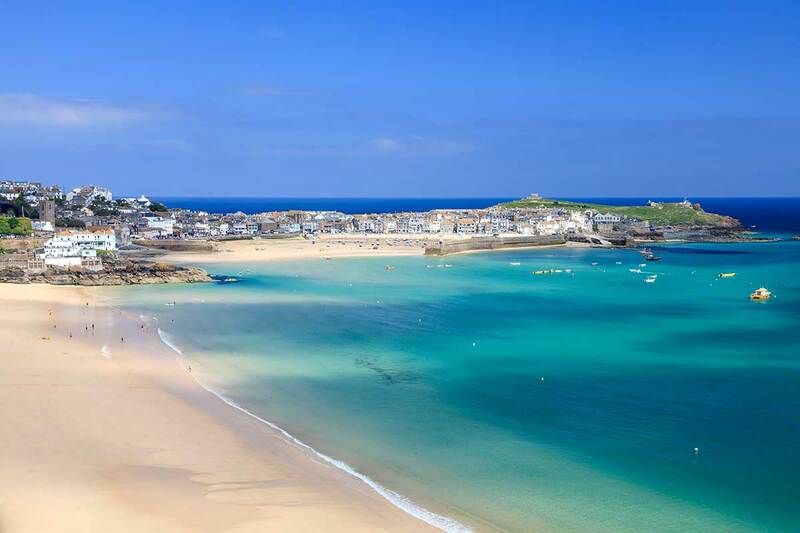 For a bite to eat, the beach benefits from an award winning seafood restaurant, which is nestled beneath the steep slopes of Porthminster Point and enjoys unbeatable and uninterrupted views across St Ives Bay to Godrevy Lighthouse. The cafe is open daily for breakfast, lunch and dinner and a selection of homemade patisserie and locally roasted fine coffees are available all day long. If you’re looking something a little more ‘thirst quenching’ look no further than the Beach or Garden Bar, and if you’ve forgotten any beach essentials there are several shops to chose from. As with many Cornish beaches there is a seasonal dog ban which runs from Easter Day to 1st October.